Qutbuddin and his kin have made a mockery of Dawat, its texts, and its institutions: the foremost being the institution of nass. This has always been the way of those who have opposed haq na saheb. The last fifty years are testimony to al-Dai al-Ajal Syedna Mohammed Buhanuddin’s RA dedication to Imam al-Zaman’s Dawat and the exemplary manner by which he looked after the amaanat he had been given. Burhanuddin Moula RA was diligent; his each and every action and statement was for the sake of Dawat and the betterment and protection of Mumineen. This reflects most apparently in the manner by which he proclaimed nass. Throughout his life, on multiple occasions, with different witnesses and in different manners, both explicit and implicit, Syedna Burhanuddin RA made it clear beyond doubt, that his mansoos and successor was al-Dai al-Ajal Syedna Mufaddal Saifuddin TUS. Those who claim otherwise insult his memory and the very maqaam of the Dai al-Mutlaq, as already established below (see post #23/24). Apart from the hundreds of ishaaraat and nass e khafi instances (too great to display on a webpage), there are FIVE known instances of nass carried out by Burhanuddin Moula RA with the same diligence, wisdom and sagacity as his every other act. Here we will discuss the nass of 1388H. The events of the nass are recorded on three folios carefully protected and conserved, written by Miyasaheb Shaikh Ibrahim al-Yamani. Miyasaheb had the habit of recording the daily activities of Syedna Taher Saifuddin RA and Syedna Mohammed Burahnuddin RA throughout his service to them so that their wise and erudite deeds and words could be preserved for posterity. Apart from his normal diary, Shaikh Ibrahim also recorded instances in which he was entrusted with certain Dawat secrets that often were not included in the Daily activity diary. As is narrated in the document, on the eve of the 11th of Zilqadah al-Haram, 1388 (Monday night, January 27th, 1969) he was summoned by Syedna Burhanuddin RA along with two other individuals, Sh Abdulhusain Sh Gulamali Tambawala and Sh Abdulhusain Sh Ibrahim Abulqadir (Shipchandler). The passage begins with Miyasaheb Shaikh Ibrahim mentioning the time and venue (Syedna Burhanuddin’s RA private quarters) of this incident and then quotes the words of Syedna Burhanuddin RA, including the opening passage in Arabic. Syedna Burhanuddin RA begins with his gratitude towards Imam al-Zaman and Syedna Taher Saifuddin RA. He then mentions how his father had chosen him as his mansoos, and likewise, he was now choosing his son “Bhai Mufaddal Bhai Saifuddin” as his own mansoos. Burhanuddin Moula RA expresses his expectations and desires from his son and concludes by seeking testimony from the witnesses present. In his closing remarks, Syedna Burhanuddin RA instructs those present to keep this incident and issue hidden until its time to become known arrives. After Miyasaheb Shaikh Ibrahim al-Yamani finishes the transcript of the incident, he seeks Syedna Burhanuddin’s RA authorizing signature and attestation. In a different ink, with a different pen, Syedna Burhanuddin RA attests the document at the bottom with his signature. Burhanuddin Moula RA, in his unparalleled attention to detail notices that one of the names of the witnesses is incomplete and completes it by adding the word ‘Abdulqadir’ at the end of his name with his own hand. Saif al-Huda (the sword of guidance) in his radiance is like the sun amongst the stars; amongst the Doat he is mufaddal (has been given honor and fadl). Saif al-Huda Mufaddal, amongst the Doat, in his radiance is like the sun amongst the stars. As the FatemiDavat site repeatedly stresses (unfortunately, to illogical conclusions), the Dai’s every action and statement has great meaning. Here, the deliberate use of the word Mufaddal with Saif al-Hoda by Syedna Mohammed Burhanuddin RA is no doubt a reference to Syedna Mufadal Saifuddin. That the verse was composed in the same year that Moulana RA was to make his nass apparent is not mere coincidence, but Allah Ta’ala’s divine design and Syedna Burhanuddin’s RA erudition and hikmat. The 1388H nass was revealed by Syedna Burhanuddin RA prior to embarking upon one of the most historical journeys ever undertaken by a Dai in the period of satr. In 1388H, Buhanuddin Moula RA performed his first Hajj after ascension to the throne of Dawat. 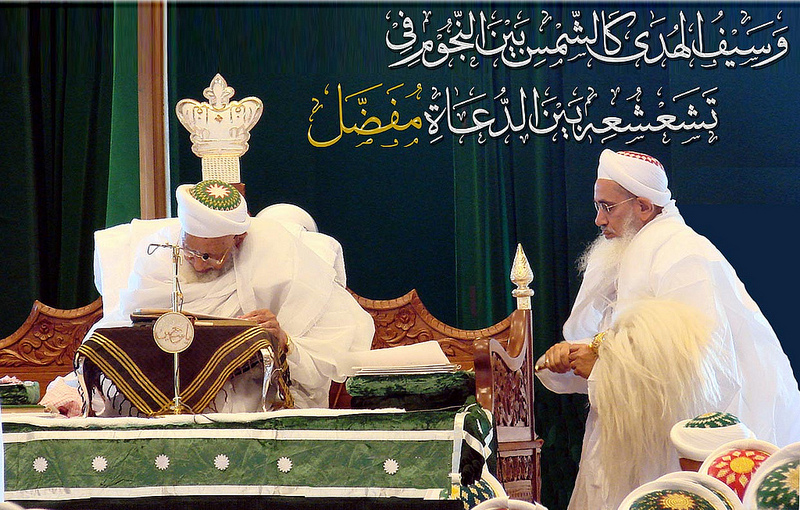 After completing Hajj, Syedna Burhanuddin RA travelled to Syria, Misr (Egypt), Tunisia, Algeria and Libya. It was destined for Burhanuddin Moula RA to be the first satr na Dai to visit the Fatemi cities of North Africa. For such a historic journey, Moulana Burhanuddin RA kept his mansoos Syedna Mufaddal Saifuddin TUS by his side. Syedna Burhanuddin’s RA diligence and foresight is further highlighted in the incident of 1415H. Moulana RA himself narrates the 1388H nass to Shaikh Ibrahim’s son, Shaikh Abdulhusain al-Yamani nearly 27 years later on the 20th of Jumaad al-Ulaa, 1415 H (24th October, 1994). Instead of just calling Shaikh Abdulhusain and revealing the nass to him, as he did with his father, he narrates the entire incident of 1388H again thereby corroborating its proceedings. Syedna Burhanuddin RA recounted to Shaikh Abdulhusain the event and individually named all those he had kept witness to the 1388H nass. He also revealed that Bhusahebah Amatullah Aisahebah QR was also privy to this great secret and had done an exemplary job in safekeeping her amaanat. Today, an eyewitness to this historical event, Shaikh Abdulhusain al-Yamani is in our midst and has repeatedly recounted the incident to numerous people. In all their anticipation and preparation for the death of the Moula RA they claim to be their beloved father, the one whose grief Khuzaima is allegedly consumed by, the FatemiDavat.com cult did not anticipate this evidence of Moula’s RA nass on Syedna Mufaddal Saifuddin TUS. They built their case on various distortions of Dawat texts, fabricated historical incidents and futilely attempted to create doubt in the instances of nass that they were aware of carried out by Burhanuddin Moula RA, yet this unknown document has taken them by storm. Now they are posing irrelevant hypothetical questions and accusing Dawat of forgery in order to create doubt in the minds of their followers. That they are attempting to prove that this document of 1388H is false is the greatest evidence of their own falsehood, for they know that if it’s veracity is established then everything they have said will be proven to be a lie. They have no choice but to contest this document and by doing so they have dug their own grave. For as easy as it is to forge a document with today’s technology, that same technology with greater ease can prove it’s authenticity beyond any doubt. I ask those who have accepted Khuzaima as their Dai to pause and reflect. When you realize that this document, and subsequently all the other instances of nass are true, are Haqq, how will you then reconcile your beliefs with this reality, this haqiqat? Can you imagine what other lies Khuzaima and his deceivers will concoct for you? What other elements of your faith are you willing to allow them to violate and distort in order to achieve their delusional and selfish goals? The document of the 1388H nass is genuine, as are all the other instances. Syedna Mohammed Burhanuddin RA has appointed Syedna Mufaddal Saifuddin TUS as his mansoos and the 53rd Dai.